"He told us he was going to Germany and if he ended up in London, maybe, he had a technical stopover." Nigeria’s main opposition party, PDP, has said it was not aware that a senator, Godswill Akpabio, was going to London to meet with President Muhammadu Buhari on Sunday. Speaking with journalists on Monday, the party’s spokesperson, Kola Ologbondiyan, said the former governor of Akwa Ibom State told members of the party’s National Working Committee that he was on his way to Germany. Mr Ologbondiyan also denied the party’s prior knowledge of Mr Akpabio’s defection to the ruling All Progressives Congress. “He told us he was going to Germany and if he ended up in London, maybe, he had a technical stopover. 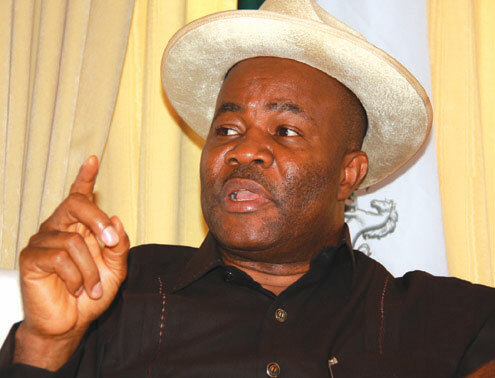 Mr Akpabio is believed to be set to defect from the PDP, where he leads as Senate minority leader, to the ruling APC. He recently met with President Muhammadu Buhari in London and a leader of the APC, Bola Tinubu, in Abuja. According to officials in the presidency, he is expected to be received in a grand reception on Wednesday or Thursday in Akwa-Ibom. Mr Akpabio has neither confirmed nor debunked the development but information emerged on Tuesday morning that he has resigned his position as Senate minority leader.